Western blot analysis of extracts from Jurkat and K562 cells, using AMPKgamma1 Antibody. 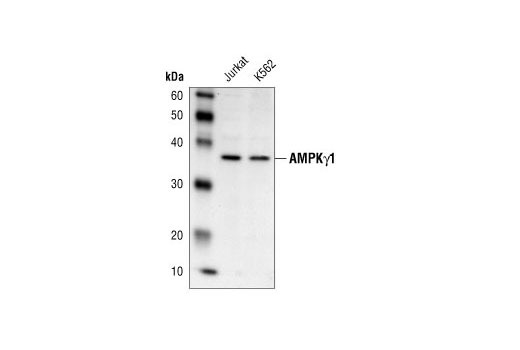 AMPKgamma1 Antibody detects endogenous levels of AMPKgamma1 protein. Polyclonal antibodies are produced by immunizing animals with a synthetic peptide corresponding to residues near the amino terminus of human AMPKgamma1. Antibodies are purified by protein A and peptde affinity chromatography. AMP-activated protein kinase (AMPK) is highly conserved from yeast to plants and animals and plays a key role in the regulation of energy homeostasis (1). AMPK is a heterotrimeric complex composed of a catalytic α subunit and regulatory β and γ subunits, each of which is encoded by two or three distinct genes (α1, 2; β1, 2; γ1, 2, 3) (2). The kinase is activated by an elevated AMP/ATP ratio due to cellular and environmental stress, such as heat shock, hypoxia, and ischemia (1). The tumor suppressor LKB1, in association with accessory proteins STRAD and MO25, phosphorylates AMPKα at Thr172 in the activation loop, and this phosphorylation is required for AMPK activation (3-5). AMPKα is also phosphorylated at Thr258 and Ser485 (for α1; Ser491 for α2). The upstream kinase and the biological significance of these phosphorylation events have yet to be elucidated (6). The β1 subunit is post-translationally modified by myristoylation and multi-site phosphorylation including Ser24/25, Ser96, Ser101, Ser108, and Ser182 (6,7). Phosphorylation at Ser108 of the β1 subunit seems to be required for the activation of AMPK enzyme, while phosphorylation at Ser24/25 and Ser182 affects AMPK localization (7). Several mutations in AMPKγ subunits have been identified, most of which are located in the putative AMP/ATP binding sites (CBS or Bateman domains). Mutations at these sites lead to reduction of AMPK activity and cause glycogen accumulation in heart or skeletal muscle (1,2). Accumulating evidence indicates that AMPK not only regulates the metabolism of fatty acids and glycogen, but also modulates protein synthesis and cell growth through EF2 and TSC2/mTOR pathways, as well as blood flow via eNOS/nNOS (1). Hardie, D.G. (2004) J Cell Sci 117, 5479-87. Carling, D. (2004) Trends Biochem Sci 29, 18-24. Hawley, S.A. et al. (1996) J. Biol. Chem. 271, 27879-27887. Lizcano, J.M. et al. (2004) EMBO J. 23, 833-843. Shaw, R.J. et al. (2004) Proc. Natl. Acad. Sci. U S A 101, 3329-3335. Woods, A. et al. (2003) J. Biol. Chem. 278, 28434-28442. Warden, S.M. et al. (2001) Biochem J. 354, 275-283.